Il Grido (The Outcry, 1957), Michelangelo Antonioni’s fifth feature film, was something of a departure from most of his offerings, because of the social milieu depicted in the film. By and large, Antonioni’s films were usually situated in and concerned with relatively privileged social groupings. The people in such more advantaged social strata had the means to look beyond the immediate concerns of their present circumstances and grapple with the question of what they really wanted out of life. But Il Grido was more in tune with the the contemporary Italian Neorealist subject matter of that time and was concerned with working-class people struggling to make their way in the modern industrial world. But notwithstanding whatever implicit social themes may be lurking in Il Grido, the real focus even in this film is still concerned with Antonioni’s fundamentally existentialistic motif about what one ultimately seeks out of life and whether the longed-for satisfaction is even attainable. The story of Il Grido is about an industrial mechanic, Aldo, and the events in his life after his seven-year affair with a married woman comes to an end at the beginning of the film. The narrative can be partitioned into sections that are associated with the women with whom he is intimately involved at various stages of the story. Each narrative segment outlines a further step lower in the ladder of Aldo’s decline. The Breakup with Irma (23 minutes). At the outset a process of slow disclosure informs the viewer that the husband of a woman, Irma, has just died in Australia. In the husband’s long absence Irma has been living with another man, Aldo, for the past seven years, and they have a young six-year-old daughter, Rosina. When Aldo later learns about the death of Irma’s husband, his hopes that he and Irma can now finally be legally married are crushed by Irma’s announcement that she is leaving him for another man whom she has recently met. The heartbroken Aldo is a typical working-class male, taciturn and tough, a person with few sources of counsel or solace. When he talks to his mother, she simply scolds him for having lived with a married woman for so many years and tells him that everything is his own fault. He tries earnestly to dissuade Irma from splitting up with him, but she is adamant. Frustrated by his powerlessness to change things, Aldo tries to assert his manly authority by roughing her up in public and slapping her around, which of course only seals the deal of their breakup. With his life crushed in the local company town near Ferrara, Aldo absconds with his daughter, Rosina, and takes to the road. Elvia (21 minutes). Aldo and his daughter now visit a past flame, Elvia, whom he had abandoned for Irma. 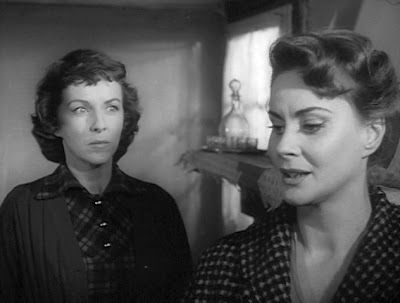 Elvia, played by American actress Betsy Blair in a reprise of her Oscar-nominated role of Clara in Marty (1955), is a modest, homespun woman who is still enthralled with Aldo and is still available. Aldo spends some time with her going dancing and attending speedboat races, and he tentatively succumbs to the restoration of their old relationship. But when Irma, looking for Rosina, traces Aldo’s steps and shows up at Evia's door, Elvia is hurt to learn that she has only caught Aldo on the rebound after being dumped by another woman, and she confronts Aldo about it. Further souring things, Aldo finds himself distracted and aroused by Elvia’s now-grown-up and luscious younger sister, Edera. Realizing that this situation with Elvia isn’t going to be an answer for him and that he doesn’t really love Elvia, Aldo leaves early in the morning the next day with Rosina in tow, without saying good-bye. Virginia (36 minutes). On the road again and hitching rides on oil trucks, Aldo stops to stay for a bit at a roadside gas station run by a young widow, in what is the most compelling and magnetic sequence in the film. The widow Virginia is assertive and self-reliant, not to mention sensual and voluptuous. She gives Aldo all sorts of come-hith er signs, and finally practically seduces him. But ultimately, Virginia wants total involvement, and she demands a commitment that Aldo is not really ready to give. Determinedly, she places her alcoholic and increasingly senile father into a government-run rest home and then demands that Aldo do similarly and send Rosina away so that they can have some time for themselves. Aldo assents and does reluctantly put Rosina (about whom he really does care) on a bus back to Irma, but the whole thing depresses him, and he finally decides that Virginia is not going to be the answer, either. He hits the road again. Adreina (20 minutes). Walking alone along the road, Aldo spies a Po River fishing dredger and signs on as a mechanic. He finds quarters in a desolate thatched shack by the river, and soon he hooks up with a pretty prostitute, Adreina. Adreina likes him, too, but she wants him to have more get-up-and go. She’s a woman who has had to live by her wits, and she complains that he is too passive. Aldo can’t imagine a long-term life with Adreina, either, and once more takes off. Finale (16 minutes). Time has passed, at least a year, and Aldo is still a drifter, hitching rides on the back of truck beds. He happens to pass by Virginia’s gas station and learns that Irma had sent a postcard there awhile ago. Still fixated on Irma and Rosina, he heads back to Ferrara, which is in the middle of union action protesting plans to demolish the sugar refinery and build a military base on the site. 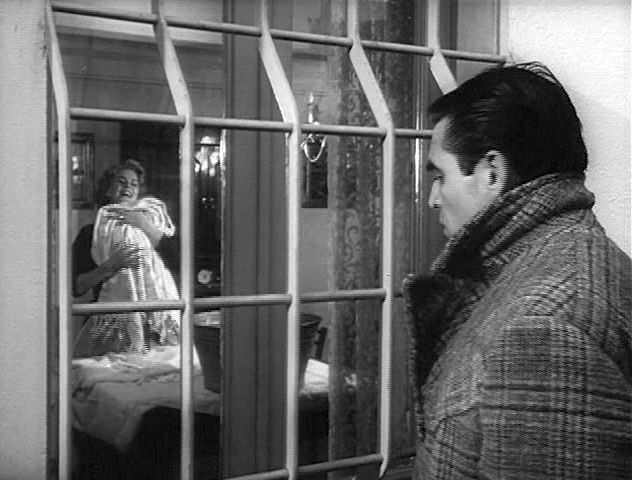 In the midst of this turmoil, Aldo wanders past Irma’s lodgings and sees through a window that Irma now has a new baby. Then he walks over to the refinery tower where he used to work and climbs to the top. Irma, having spied him through the window, rushes out after him. When she calls up to him at the top of the tower, Aldo falls to his death. The basically pessimistic theme of Il Grido concerns the pervasive disconnect between people, specifically their failure to communicate on an authentic level and achieve some sort of personal fulfillment. This would be a theme that Antonioni would continue to explore with visual eloquence in his subsequent work. In particular over the course of his next three films, Atonioni would continue to ponder the apparently inevitable impermanence of man-woman relationships. 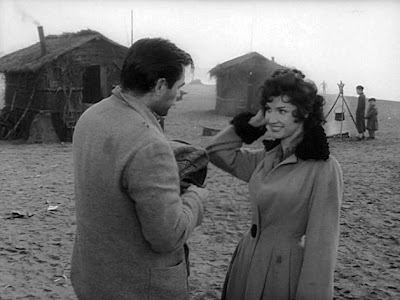 Antonioni’s characteristic and celebrated mise-en-scène invariably emphasizes the physical architecture of an environmental space in which the characters interact. 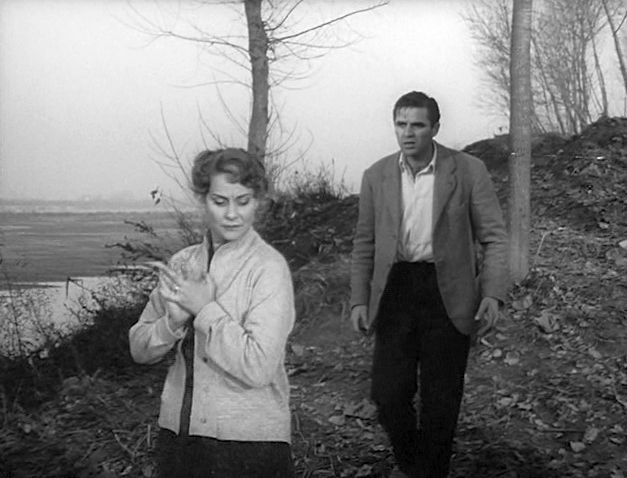 In this film that space is the bleak landscape of the Po River region around Ferrara in northern Italy where Antonioni grew up. There are numerous evocative panning and tracking shots in the film, but not so many complicated and choreographed moving-camera shots that would characterize some of his later masterpieces. Altogether the cinematography here gives rise to a feeling of loneliness and isolation that pervades the atmosphere of the film. On top of that, the piano-based musical score further accentuates the interior loneliness of the landscape settings. Moreover, the sense of loneliness is further enhanced by the conventional dubbing scheme employed, which lends something an interior feeling to the dialogue. The dubbing also undoubtedly helped incorporate American actors Steve Cochran (as Aldo) and Betsy Blair (as Elvia) into the shooting, but dubbing was a standard feature for Continental films with multilingual destinations then – even Italian Dorian Gray (as Virginia) had her voice dubbed by later Antonioni favorite Monica Vitti. 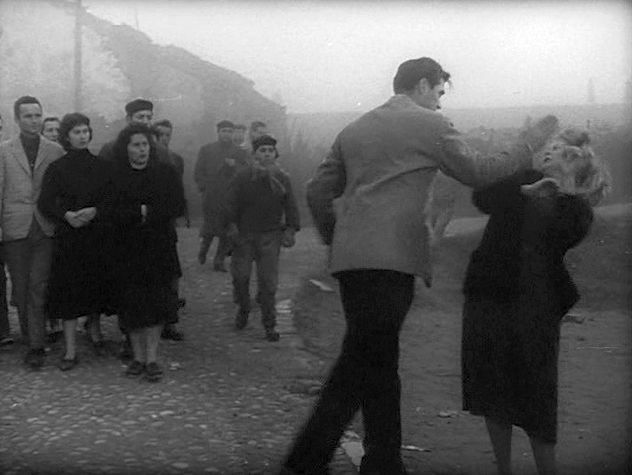 In terms of visual styles, it is interesting to compare Il Grido with Federico Fellini’s masterful La Strada (1954). 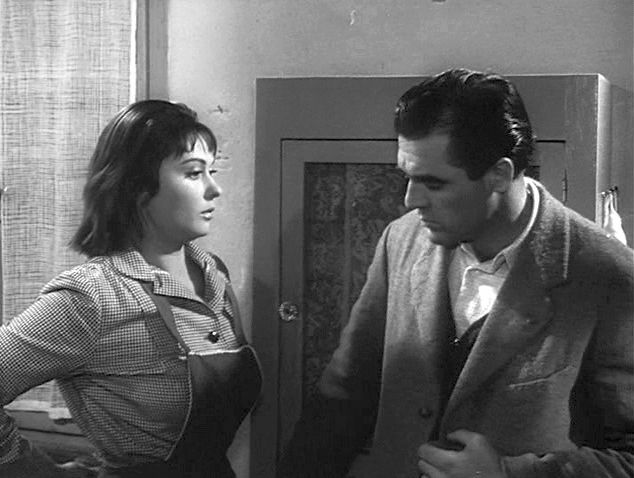 Both films depict relatively inarticulate, brutish itinera nt working-class characters, Zampanò and Aldo, who travel about the Italian countryside. Both Zampanò and Aldo are frustrated and unable even to articulate what it is that they really want. But there is a difference in the key man-woman relationships depicted in the two films. The object of Aldo’s obsession in Il Grido, Irma, and the issue of why she is so treasured, are only alluded to and presented at the fringes. Aldo’s overriding, core passion is left relatively unexamined. This contrasts with, and consequently compares unfavorably with, La Strada, where the key relationship between Zampanò and Gelsomina is developed to the point where the viewer understands the nature of it much better than Zampanò does. There are two seemingly random remarks that Aldo makes during the course of Il Grido that are keys to understanding the nature of his funk – his psychological depression that he cannot seem to straighten out. One of those key commentaries is when he mentions that he used to like to look down from the top of the refinery tower and survey his work area and the surrounding town. He could even see his own dwelling from that height. Everything was laid out for him in an organized, well-structured manner in those days. But after he lost Irma, he lost his bearings. 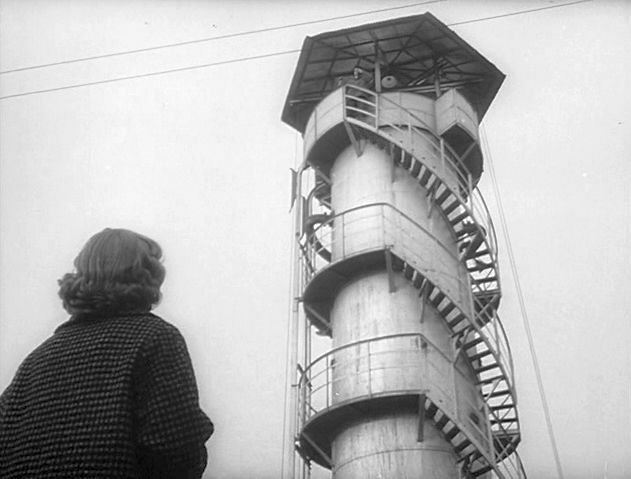 At the end of the film, he again climbs the refinery tower (which will soon be demolished) perhaps to try and recover that feeling of orientation. This time, though, the surroundings are in chaos, with the local population rioting, and there is no compass to help establish order out of the disarray of his world. Under these circumstances in that last scene, Aldo can’t help but feel dizzy: the tower no longer provides the mental scaffolding that he seeks for clarity. Another of the key remarks of Aldo in the film is when he reflectively remembers the time when he first met Irma. Long ago a group of his friends had once come together to go out to a dance hall, but one of them, Irma, said that she would prefer to go to the museum, instead. So he went with her to the museum. This was the beginning of their relationship, and it reveals that Aldo, who was clearly not an intellectual, was still a person who wanted a deeper and more personally intimate relationship with a woman. This is what he thought he had with Irma, but she had eventually drifted away from him over the years and had found someone else that pleased her more. 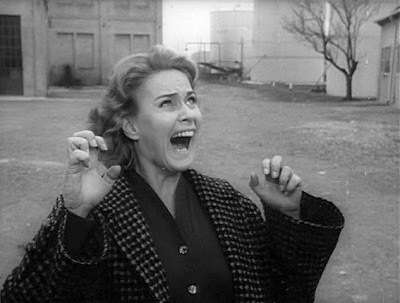 If one were to look for an underlying sociopolitical theme to the tale of Il Grido, beyond the level of personal interaction, one might claim there is a suggestion in the film that postwar modernism was progressively removing conventional modes of authentic interaction for working class people, and thereby was disempowering them, and thus for men in particular, was emasculating them. Throughout the film there are images of the bleak and barren Po River landscape that has little of green nature – mostly we see images of inhuman mechanical operation, such as the refinery tower, speedboats, the gas station, trucks, motorbikes, and the like. Aldo, the mechanic, has become used to dealing with inanimate, mechanically-driven devices, but what is lacking and what he needs is personal, human interaction, and he doesn’t know how to achieve this. Stuck in this quandary, Aldo’s personal evolution is progressively towards stupefaction, inaction, immobility. At one point he mentions to Virginia that he fundamentally lacks “willingness” – he is powerless. His only real assertive actions are pointless and self-destructive physical beatings of his women and his child Rosina. The very final shot of the film is an overhead pan looking down from the refinery tower – first from a frame of the mass of workers running down the street in protest and then panning over to a closing frame of Irma kneeling over Aldo’s dead body. This provides a thematic linkage between the dehumanizing sociopolitical effects of modernism and the personal tragedies to which that dehumanizing gives rise. These themes would be picked up again in his later films, particularly Red Desert (Il Deserto Rosso, 1964) . The four principal women, on the other hand, are not passive; they are all looking to hook up with a man of action, and they are trying, in their various ways, to assert themselves and take action. But there is a gradation to these women whom Aldo meets, and this gradation provides a narrative progression to Aldo’s decline. Each woman is a willing and eager partner, but each is successively more assertive and potentially more demanding over the long term. Irma is apparently the woman who offered, at least in the past, the richest interaction. But she is the most self-contained: she needs him the least, and she offers him the least support. Elvia is thoughtful and supportive, but there is apparently a reduction in depth in connection with a possible long-term relationship. Unlike Irma, Elvia likes to go dancing, not to the museum. And she needs Aldo emotionally, possibly suggesting that she takes more than she gives. Virginia, the former farm housewife, is more active, but perhaps her lower class status represents a further decline in the potential depth of a relationship. Their relationship is very physical and apparently not as deep as with the previous two women, so a fulfilling long-term intimacy may have had dubious prospects. Adreina is open, spunky, and the most assertive of all of them, but she is also at the lowest level of society. Their relationship is basically sexual, rather than romantic, but these are the terms by which she is accustomed to operating as a business. By necessity, she has had to learn to sees things in terms of her material survival first. Thus each woman represents a stage in a progression. Although the primary focalization of the film is on Aldo, as we enter into each of the narrative segments the focalization starts to drift over to the principal woman involved, sometimes exclusively looking at things from her perspective. Each woman represents a further step away from the ethereal to the physic al. To my mind, each of the women he meets is successively more attractive physically, although Aldo was looking for a relationship on another level and treasured Irma the most. But as the film progresses, Aldo’s aimlessness and lack of willingness becomes catastrophic. At the very end of the film, he doesn’t jump from the tower to commit suicide. Instead he has lost even the willingness to keep himself from falling. He passively succumbs to the vertigo and lets himself fall. His powerlessness has paralyzed his ability to act – even to save his own life.